In December 2004, the station formerly known as Channel 5 screened a promotion for a certain ‘Top Up TV’ overlaid on top of their regular programming. It was crass, it was intrusive and it just happened to contravene a healthy selection of regulations which Five is bound to obey by virtue of its licence. The nation was outraged (well, they would have been if there had been anything worth watching underneath the advert anyway) but were comforted by their white knight – Ofcom! – riding to the rescue and promising to investigate. Since then, we’ve had decisions on a new Pope and an old Prime Minister. Ofcom, however, took a more leisurely approach to life. 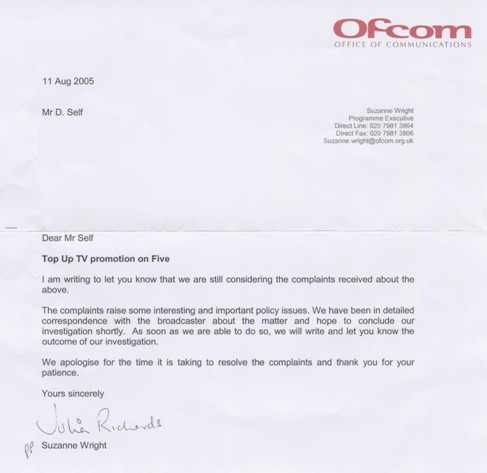 In March 2005, 3 months later, they had worked tirelessly and succeeded in having “written to the broadcaster”. I know, because they were kind enough to write another letter and tell me so. I even blogged it. But never fear, because good things come to those who wait. More specifically – a second letter! And this time, they have the kind heart to enthuse about the “interesting” nature of my complaint. Oh Ofcom – flattery will get you everywhere. But let’s not get carried away. After all, Ofcom have a difficult task here. Wading through complex legalese, such as “specific promotions for any particular platform service provider… will not be permitted, outside of paid for advertising minutage” and “no interactive icon present during the course of editorial programming may be commercially branded” can be interpreted in many different ways. To a layman, it may appear to ban a commercially branded interactive icon for a particular platform service provider occuring outside of paid for advertising minutage. But I wouldn’t want to jump to any conclusions. Ofcom certainly don’t.